It's my last night here in Danang and tomorrow, I will be heading off to Hanoi, the last leg of this work trip. I'm really starting to love this beautiful city and it's a pity I have not have much time to explore the place since work has kept me busy. Hopefully I will be able to come back here real soon, not for work but for holiday. Then I will be able to fully enjoy everything in this city. All right, back to the purpose of this entry. This is a way overdue post which was meant to be publish last week but didn't got round to doing it cause of the preparation for the work trip. Today, I have another indie nail polish brand, Daring Digits, to share with you! Special thanks to the ever lovely Mei Mei from meimeisignatures who sent me the polish for my honest review. Daring Digits Handmade Nail Polish from USA is cruelty free and big 3 free that does not contain DBP, toluene and formaldehyde. 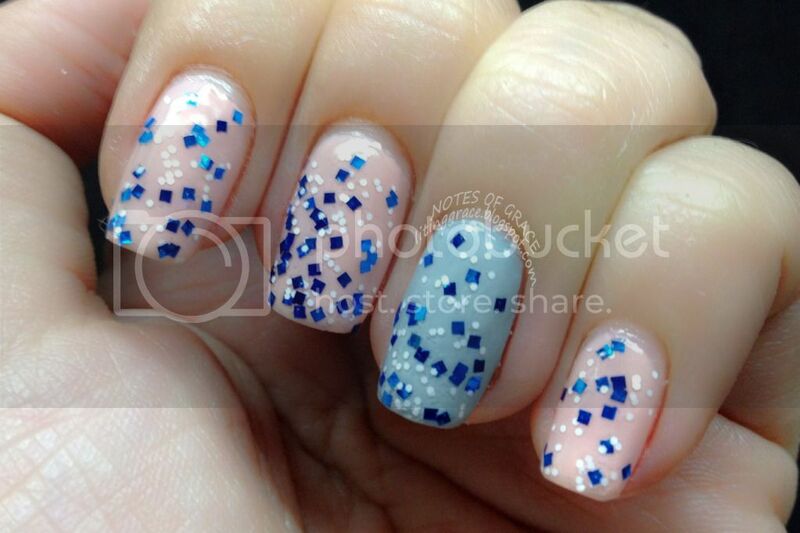 Creator of Daring Digits, Ashley only uses stainless steel mixing ball in all polishes. The base used in the polish was made to suspend glitters. A little settling is expected, but a little shaking up will bring it back to normal. As these are hand made in small batches, so they may vary slightly from batch to batch. The polish provided to me was Blueberry Square. My heart skipped a little when I first laid my eyes on this polish. 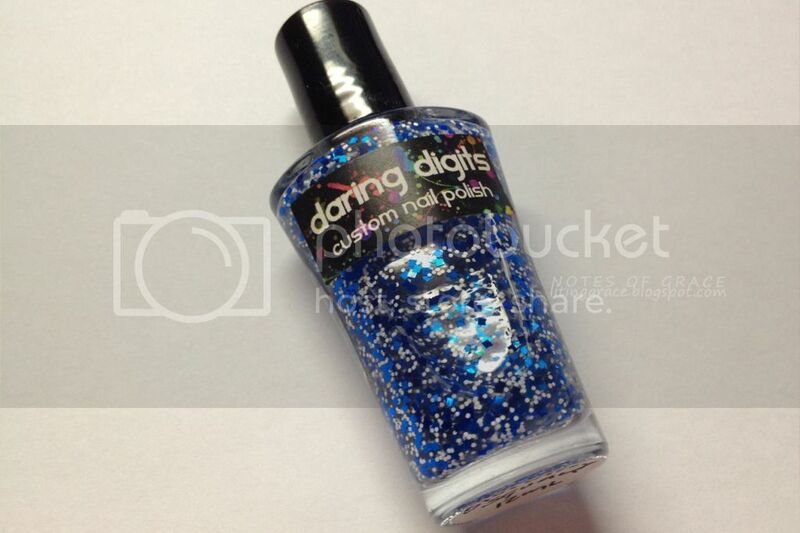 Of all of the glitter polishes that I have, this is something that is missing! 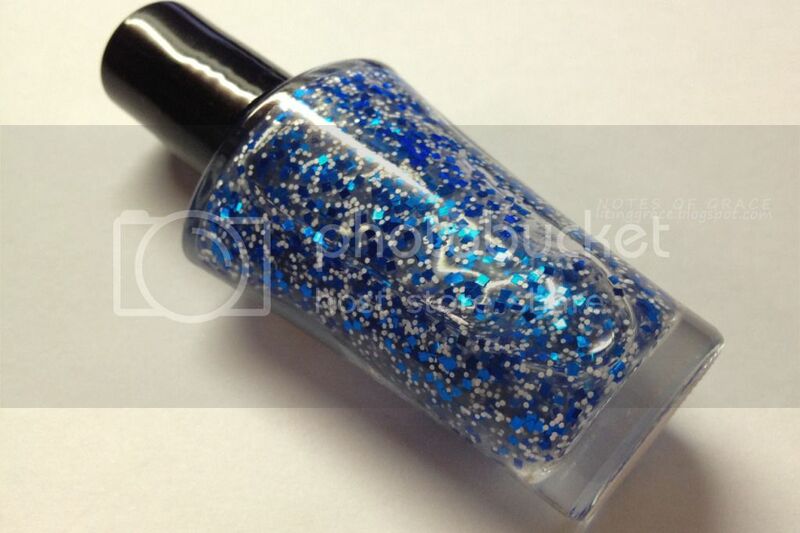 Blueberry Square is a glitter bomb that comes with medium square blue glitter and small white hexes in a clear base. Formula wise, the glitter is pretty dense; you can get a pretty good coverage with just one coat. No fishing for the glitters too! Application was pretty smooth as well, so pretty much no complaints about this polish. The only problem I had was deciding which color to layer it over. 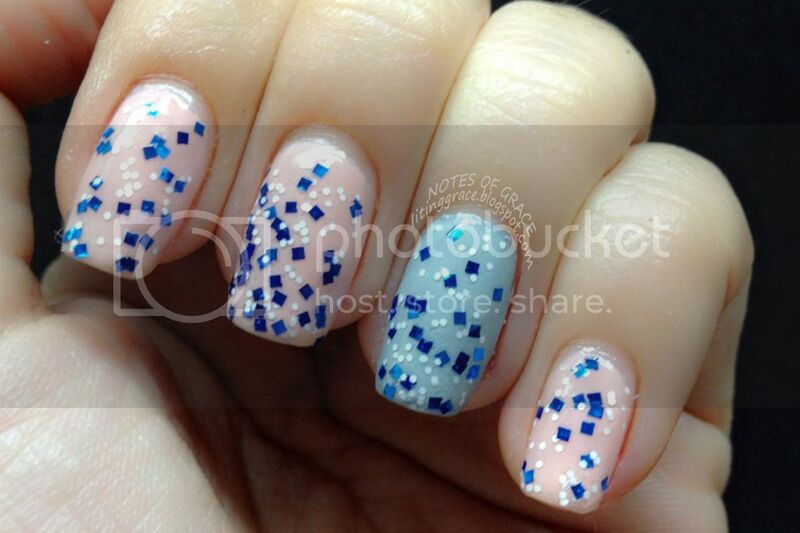 Black seems too common and a blue base would not be able to highlight the blue glitters. In the end I decided to layer it over Megan Miller Pink Lily. 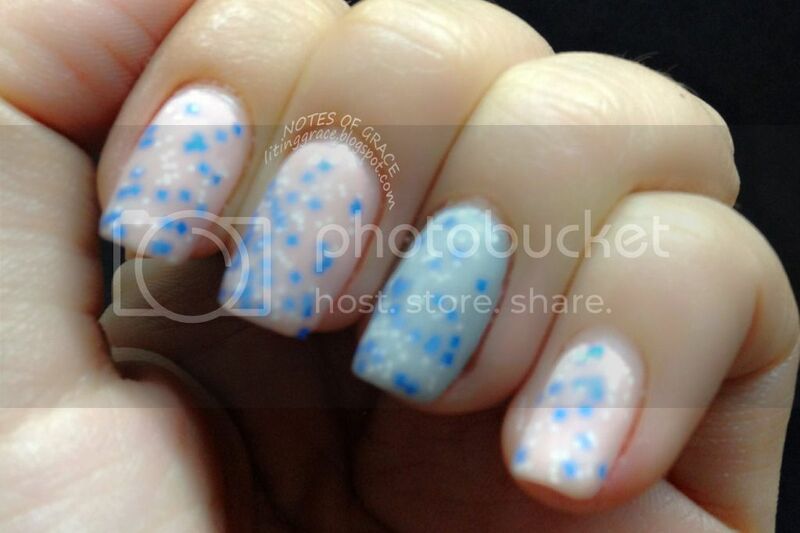 However, I still very much wanted to see how the glitter would fare on a blue base so for the accent finger, I decided to layer it over China Glaze Sea Spray, a gorgeous blue-grey color. Somehow, the grey doesn't seem to be visible in the photos, but well, never mind about that. It's not that obvious here but the square glitters are pretty reflective in real life! I wanted to see how it fared in a jelly sandwich, so I painted two coats of OPI Don't Touch My Tutu and I really loved how it turned out! And because I had not used my bottle of Essie Matte About You, I decided to layer one coat over it and voila! Another different effect! I have to say that Blueberry Square is truly versatile. You can wear it on their own (although that mean a few coats), layered over a base color, as a jelly sandwich and even under a matt top coat, it still look gorgeous. This polish is definitely a keeper. Daring Digits polishes are available at Meimeisignatures who is the exclusive stockist for Daring Digits polishes in Singapore! That's all for today's Nails Talk and I hope you love what I've shared. Will be back with another installment of Nails Talk pretty soon as I have got lots of swatches that I can't wait to share.